Preview the New Kingdom Website! Your Input is Welcome! 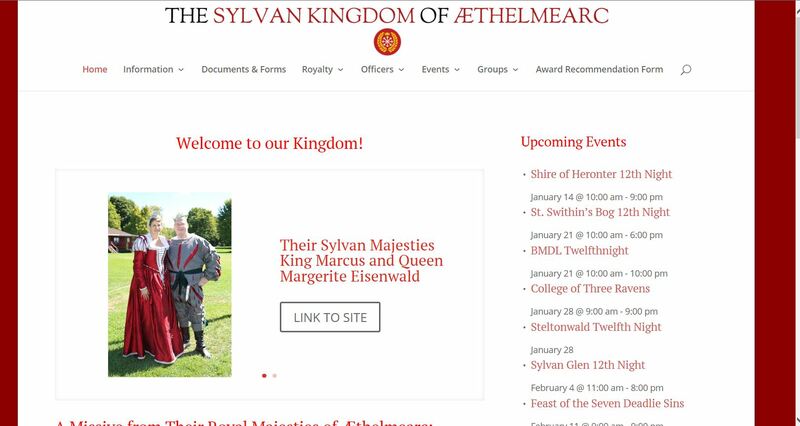 Unto the Populace of Æthelmearc does the Kingdom Webminister, Lady Amalie Reinhardt, send warm greetings! The new website build is ready for public preview to receive any needed corrections and constructive feedback. Our new site has a mobile version, if you wish to look at it on a tablet or cell phone. – The display of Google Maps for events has been fixed. – There will be a new method for submitting information for Kingdom Calendar items and there is an actual calendar to display the events. – We have all our files (policies, paper-based forms, and the like) hosted on a file server. – All our forms are hosted on (and linked to) the new form server. The dev site can be found here. Please do *NOT* bookmark this site, as it will be switched to our standard Æthelmearc web address in the future. All corrections and updates are respectfully requested to be submitted on the Website Correction Form found here. A link to this form can also be found at the bottom of the announcements on the right side of the front page. All questions should be directed to me at the ae.webminister@aethelmearc.org email address. Thank you all very much for your continued support of the Webminister’s Office! Perry! Greetings from Sólveig! I will sorely miss the extended kingdom event list which you are eliminating. It had better typography and had more information. I am talking about this page: http://www.aethelmearc.org/events.php I regularly use this web page to project events months in advance. For example, I have entered the Njal’s Saga event on my general calendar on my computer. It might also be nice to links to the event calendars for adjacent kingdoms. Some people in the kingdom live close to the border.